When I read the prompt, I wondered at what would make Harry take up the activity in such seriousness. This is what my brain delivered VERY last minute. Admittedly I had a more dramatic image in mind, but unfortunately my skills are not at that level just yet. I am actually rather happy with how it came out, and I hope the prompter is too! This drawing would not be possible without heavy referencing to 10 Dance by Satou Inoue. 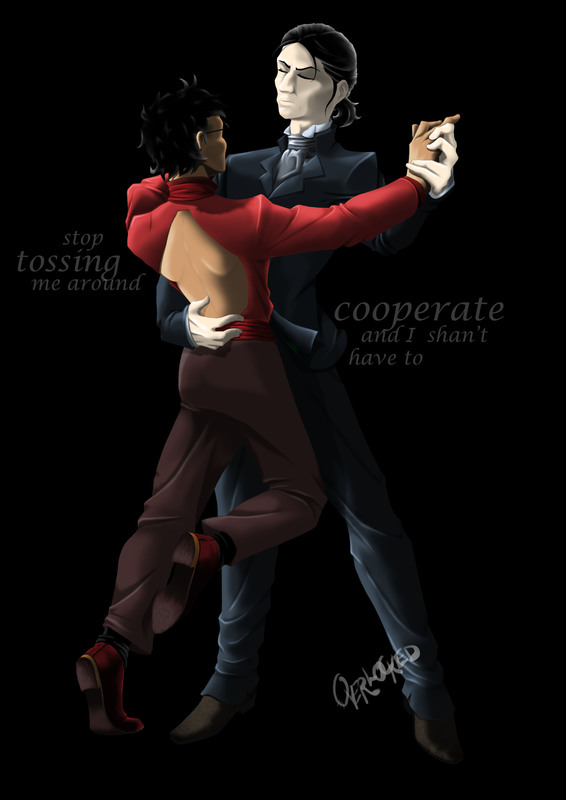 Prompt 28 from digthewriter: Ballroom dancing. It took two weeks for him to work up his courage to approach the man in the gym. Ever since he first saw him, he had thought that the man’s physique would be perfect for dance. He was not a naturally outgoing person though, and while he knew the dance studio was desperate for new members (and funds), he still couldn’t bring himself to even enter. Today, though. Today he would do it. As he stood outside the big glass windows, he peered inside – the man was there. He was on the short side, but had a compact physique that was lean instead of bulky and had displayed surprising agility while performing his exercise routine. Something about the man suggested he was listless, and it was this quality that finally convinced him to at least try. The security at the door eye-balled him when he entered and he re-evaluated what he must have looked like standing outside. The man was surprisingly friendly and called him back after he stuttered out an explanation for his odd behaviour and practically shoved the dance-studio pamphlet in the man’s face. He expressed a nonchalant interest to see the venue, and introduced himself as Harry. After an, “Oh, you’re James? That was my father’s name,” they ventured out. His enthusiasm to have found a possible new member was stomped into dust quite thoroughly as the owner and instructor explained in an agitated voice that their studio could no longer be saved. Their inability to make the rental payment the previous week had been the final straw – the landlord wanted them out by the end of the month. The owner apologised to the man for wasting his time. The man – Harry – was looking at a poster against the wall though, and cut through the apology with an inquiry about the rehabilitation program Mister Tailor had qualified for. It was an off-hand comment, but the man frowned and stared into the distance for a moment, obviously considering it. Suddenly the man looked much older; older and damaged and sad.